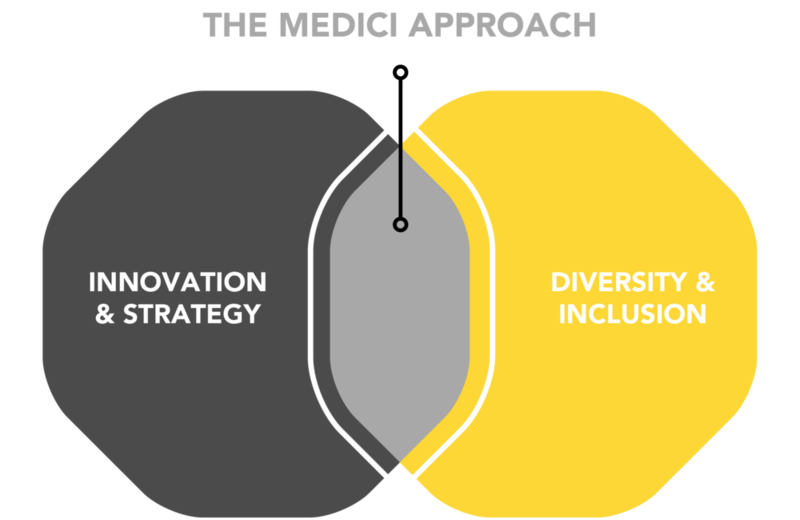 The Medici Group is a solutions firm that helps companies accelerate their innovation and growth by leveraging diversity. By breaking down silos and leveraging diverse talent, we enable organizations to move faster, unleash growth, and transform their culture. Our approach was inspired by our founder and CEO Frans Johansson’s book The Medici Effect, an innovation classic that has been translated into 21 languages. Just as the Medici family of old catalyzed the Renaissance by bringing together people from different disciplines, cultures, and backgrounds, we are catalyzing the Renaissance of today. At Medici, we believe that although much of innovation revolves around technology—the core of innovation comes from people and how they interact with other people and environments. Fundamentally it comes from how people with diverse perspectives and networks are able to make unexpected connections that break new ground. Diversity in this context is multi-dimensional referring to who we are (such as gender, ethnicity, culture, age or sexuality); what we do (such as education, industry, function or department); and how we do it (such as thinking or interaction styles). This diversity is only the most powerful when organizations are able to activate it through inclusive behavior and organizational structures that break down existing silos. This is at the heart of what we do. Our value to clients derives from our unique approach and perspective. We occupy the most powerful intersection in the world today: the place where innovation and diversity meet. This intersection defines who we are and how we can help you. Using our approach, we have helped clients move faster, create new lines of business, develop leaders who can operate in the gray, and unleash post-M&A synergies.